Because video processing is too technical to be entrusted to anyone. Because you want to preserve quality during an encoding. NOTICE: This app is only localized in English and French .The others languages are only used to localized DVD-VIDEO interactive menus, and not for the app itself. Because video is very technical domain, if you are not an expert about video technology or standards specifications, your results of your work will be poor… with MovieConverter-Studio you -easily- get good results… MovieConverter Studio will automatically fix for you all your difficulties. Exclusive Feature: Adaptation to your Television Standard (videos will be conformed …but without jerking). Your movies will no more be deformed after encoding. Exclusive Feature: …even though your videos need a more complex display (automatic detection and management of anamorphic files). Exclusive Feature: Ability to turn your videos from "square screen" to "wide screen" (and vice versa). To convert your videos for all your devices: from your Android mobile to your new connected HD television! To convert your video for Professional editing in FCPX (or in older versions of Final Cut Pro). 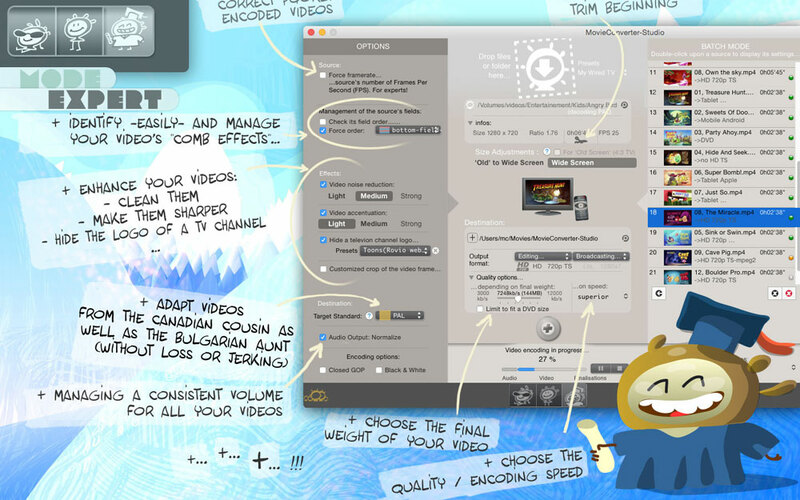 To convert your videos for editing in iMovie (for every versions). Exclusive Feature: you never encounter "comb effects" during playback, and without degrading quality like others softs do (Automatic management, according to the device used to play the video). Exclusive Feature: The Easy Mode do not damage the quality of your videos (automations are set to take over your worries). "Professional" really means something here (it's usually used as a bogus commercial argument for beginners, and only means the add of some non-understandable features only for geeks). • To visually check your "comb effects" and their readout order. • To correct the framerate of a buggy converted video. • Making videos from internet less blurry. • Remove the logo of a TV channel. 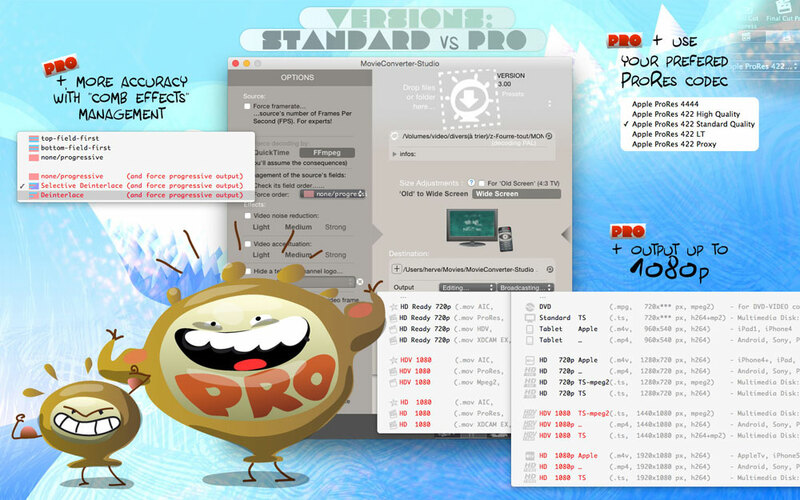 • (To reserve to experts:) MovieConverter has many automations which ensure your quality conversion… But you can override or change them too. 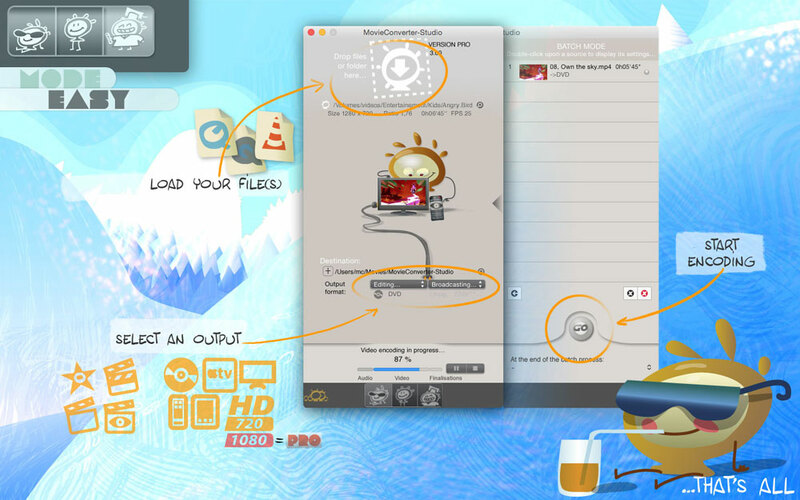 Make your settings in less than three minutes and get a chapterized DVD, with menus in full-screen and animated buttons (and burn it directly from the app). Readable onto a home DVD Player connected to every television (Exclusive Feature: onto Granny's one and her old square TV, or onto Uncle's big HD TV). Some Presets (some are provided but you can easily create your own). Trim the beginning of the video (…to remove unwanted pre-programs). Choose your bitrate (the quality/disk weight ratio of your converted file). Ability to automatically limit the bitrate (so, your final video fits well on a disk ;-)). Several presets "quality/disk weight ratio". Ability to encode in black & white. So, chose your flavor: "easy", "simple" or "expert". 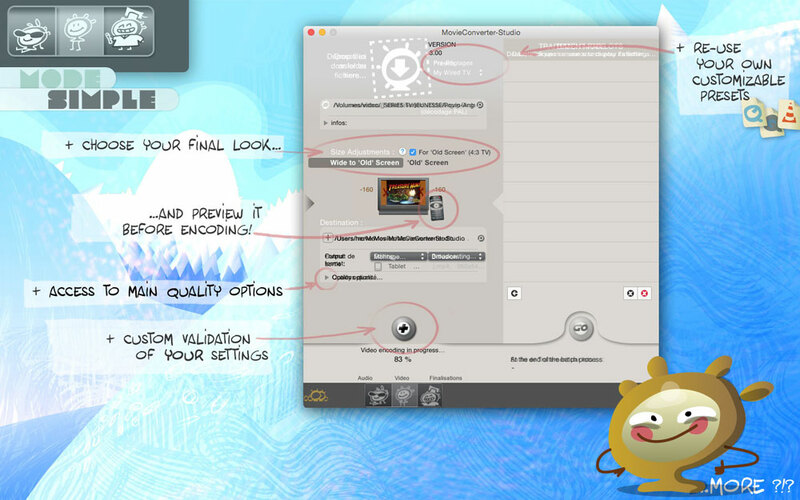 MovieConverter-Studio, expert's functions "For Dummies™".